The Canon imagePROGRAF iPF785 MFP M40 is a large format imaging system that is designed to be a complete Scan-to-Print, File, and Share solution. 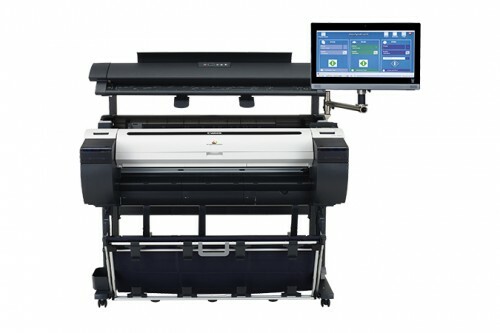 The system includes an imagePROGRAF iPF785 large format printer, M40 large format scanner, MFP stand, All-in-One Multi-touch PC, SmartWorks MFP software. This solution provides a fast and effective system for printing, copying, archiving and distributing maps, drawings, renderings, site and facilities management plans, design and layout proofs, posters and more. This Multi-Function Product’s advanced M40 scanner adds versatility to the product capabilities with the ability to scan documents up to 2mm thick, allowing users to scan more than just technical documents. The scanner has the ability to scan documents up to 315” in length as a PDF or JPEG file, and up to 590” in length as a TIFF file. The SmartWorks MFP SOFTWARE simplifies the entire Scan-to-Print, File, and Share process for users of all experience levels. Available as a free DOWNLOAD, the iPF785 MFP M40 also offers CANON's Direct Print & Share software, a cloud-portal software solution that enables the viewing, sharing and printing of files from anywhere in the world, a new shortcut print button for drag and drop printing through hot folder technology, and is compatible with almost any cloud server that's WebDAV compliant. The solution is also equipped for mobile printing through use of the imagePROGRAF Print Utility app for IPAD, available as a free download on the App Store.